If you’ve been reading my posts long enough, you know by now, I’m completely against myths. One of the aims of this site is to burst those myths with the facts. Why burst myths? Simply because they have caused too much pain in too many lives. The bible says ignorance is no defence. Facts are out here and it’s the objective of each and everyone of us to search for them. Considering the “facts” in this case are German laws which are usually in German and that can be a bit tricky for those of us who come to Germany with little to no knowledge of German, I translate it to English. Now there’s no excuse. Although technically, you can get a visa for marriage this also means that in case you get a divorce, you’re liable to be returned back home. Thus this is NOT a sure way to stay. Whether or not you can stay in Germany after a divorce will usually depend on you. German visas are only issued based on having a reason to stay in Germany. If you get married to a German and you’re a housewife, in case of a divorce, the migration office is allowed by law to send you back home as you lack a reason to continue staying in Germany (not unless at the time you already have a German passport). 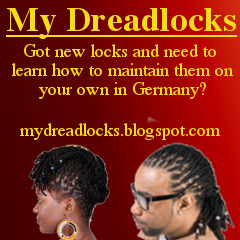 I’ve been visiting some German online forums where German men and women speak about their spouses, of course these forums don’t have ALL Germans taking part thus aren’t representative of ALL Germans, but some of the advice you see in these forums is quite scary. 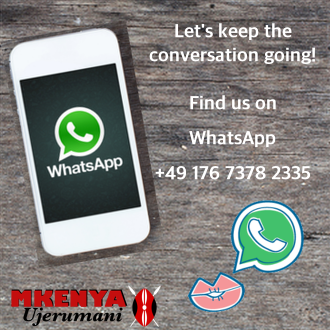 Some Germans have a habit of telling their foreign spouses that they are the only reason they (foreign spouses) are in Germany and that the foreigner’s stay depends solely on whether they stay together. My simple advice to those coming to Germany as spouses or are staying in Germany as a spouse, instead of sitting on a time bomb wondering if every time you argue with your spouse will be the end to your relationship and stay……get a reason to be in Germany. This is a dangerous myth that has seen young girls get infected with HIV in the search of a German child to allow them stay in Germany. Children aren’t a reason to be allowed to stay in Germany. 1. The Kenyan constitution now allows Kenyan women to pass on their Kenyan citizenship to their children. In the old constitution this wasn’t the case, thus many Kenyan girls in Germany who got pregnant were sure whether or not the man claimed the pregnancy, they would get to stay because their children would get German citizenship on humanitarian grounds. (It’s a basic human right that every child/person gets a nationality). Well this won’t be working. 2. The German law only considers a man, to be the father of a child if he consents to it, if he doesn’t then he isn’t the father (this changes when Hartz IV is applied for, then the government has to find the father to ensure they aren’t supporting a child, who can be supported by their father). If the child is born into a marriage union, then the husband is automatically the father by law though he can go to court and deny it. My advice to all whether married or not is to get yourself a legal reason to stay in Germany independent of your spouse and children, why? If it’s dependent on your spouse, in case of a divorce you’re home bound. Many will argue that then the children are a surer way than the spouse, right? Wrong. As stated, the current Kenyan constitution allows Kenyan women to pass on their citizenship to their child. 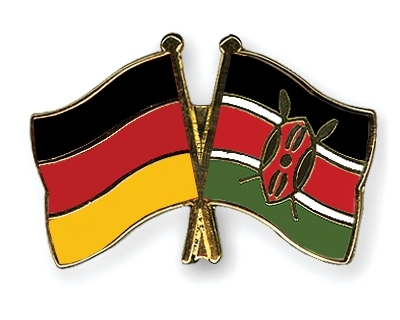 If a child is born in Germany and the father can’t be found but the mother is Kenyan, then the Kenyan embassy will be asked to issue Kenyan citizenship to the child. This is regardless of whether the child born is black or white. On the other hand, where some are married and they get pregnant to make sure “makara iive haraka”. Hopefully you’re married to someone with a heart, if not in case you try and get a divorce but the spouse decides they want you to return back home, then you’re most probably also home bound. The usual action is where the man will get the Jugendamt to take the kids away from the mother. Considering the mother in this case is usually not working and has no academic qualifications to even find a well paying job, Jugendamt will usually side with the man. When the children are taken from the mother by Jugendamt, the mother loses their reason to continue staying in Germany. For most Germans, it’s cheaper for them when the ex returns back to where they came from. If the ex remains in Germany and has no job or earns very little, the spouse will be forced to pay alimony for a specified time but if the ex is returned to their home country then the German spouse doesn’t have to pay any alimony (technically, this can however be changed). You might try and get a lawyer to argue your case, but as they say when it rains it pours. There have been cases of lawyers who connived to have their clients sent back home. You go to a lawyer tell them all the nitty gritty and they in turn use that to have you sent back home. Especially for those of us who don’t even understand German even after living here for years, the lawyer gets you to sign things you haven’t read and the next thing you know, uko JKIA. 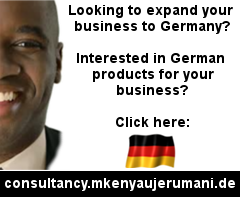 Germany is the only country I know, where foreigners (in this case Kenyans) can go back to school and have a career even if they never got to high school (Read: Pursuing a Career as a School Drop-Out). My advice to all is to go back to school and get yourself a career. It’s not an easy road, it’s not even fun but it’s sure. Some will argue that not everyone should go to school, which is true, so why not try your hand at starting your own business? (Read: Starting a Business in Germany as a Non-EU Foreigner) I know you wanted to use that argument to say, you should do odd jobs….I don’t agree. With odd jobs, you’re only tolerated. You cannot get a visa to stay and do odd jobs, essentially because most of these jobs are mini jobs where you get the €450 a month. The German government also wants to get rid of you to avoid paying for your pension in case you get old here doing odd jobs. Odd jobs are great but only if you use them as a means to an end not if they are the end. Students having to do some odd jobs to finance their studies, or someone doing odd jobs to gain a bit of extra cash to finance that HUGE mansion you’re building back home or for capital for your next venture, then go right ahead. BUT if you’ve decided this is the job for life, that’s not a wise move. Not only does it pay badly but it’s very unhealthy for you, before you argue about that. Research of the effects such jobs have on your knees, back and depending on where the job is even on your internal organs. 3. If you already have a visa that is dependent on your marriage, do something that will make you a “valuable” member of this society so that they aren’t looking for the easiest way to send you back to where you came from. Do an ausbildung or start your own business even if it’s a salon or afroshop or get a job in the field you trained in back home. Mind you, you don’t have to always do what everyone else has done, some of you have amazing talents, use that even to become a freelancer. Teach English, be an interior designer, write articles for newspapers and magazines, have a boutique….Kenyans are very innovative. Don’t argue you’ve never seen that kind of shop in Germany before thus can’t open one, be the first to do so. If you’ve never seen it done, be the first to do it. Research already shows that violence in relationships has a higher occurrence in relationships where one spouse is the sole bread winner (Read: Business as a chance out of a Violent Relationship).